Airlie Beach is the gateway to the Whitsunday Islands, but you don’t have to stay on one of the islands to enjoy all the area has to offer. By staying in Airlie Beach you can enjoy the land-based activities and well as having easy access to the many day trips to the islands and the Great Barrier Reef. One place to stay is Whitsunday On The Beach which is situated next to Airlie Beach Lagoon, and offers self-contained units with air conditioning and kitchenettes. Free Wi-Fi and free parking for 1 car are included. Most units of Whitsunday On The Beach feature balconies or patios, from where you can enjoy views of the sea or Airlie Beach. 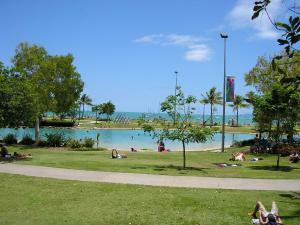 Guests have direct access to Airlie Beach Lagoon. There is also an outdoor swimming pool guests can use. At the tour desk, guests can book several tours to the Great Barrier Reef. Whitsunday On The Beach is within walking distance from restaurants, entertainment and shopping. Hamilton Island Airport is only 26 km away. Prices start at under $130 per room per night! See 60 other Airlie Beach accommodation choices here.